Spring is in the air, and unfortunately, so are seasonal allergies. Pollen, mold, and smog can bring on runny noses, sneezing fits, and itchy eyes, and sometimes those symptoms can be exacerbated among seniors. Here are a few tips for Oshkosh hourly caregivers looking to help seniors conquer the season of the sneeze. Allergens often come into the house on your shoes and clothes. Keep the pollen count at a minimum by removing and leaving shoes at the door. Vacuum your loved one’s home frequently and use machine-washable area rugs on the floor. Keep filters on any air conditioners clean and when pollen counts are high, use the air conditioner rather than opening a window. These steps will keep allergens outside where they belong. For severe allergies, make an appointment with your loved one’s allergist. They can prescribe different medications and work with seniors to develop plans to avoid pollen, mold, and the situations that can bring on serious allergy attacks. 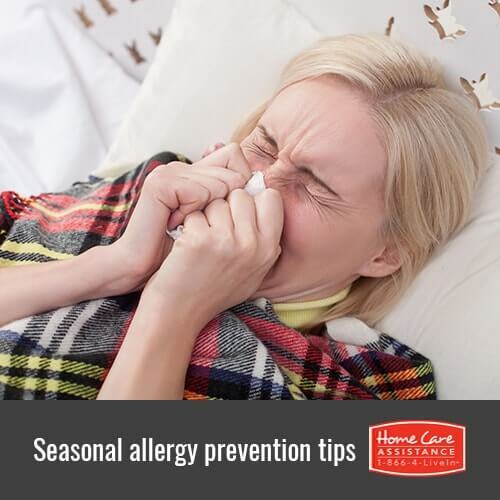 It helps to stay a step ahead and develop a strategy before allergy season hits. Synthetic fabrics attract pollen when they rub together because these materials create an electrical charge, and pollen is also charged. Look for more natural fabrics for your loved one to wear. Seniors who’ve been around allergens should shower and wash their hair and clothes afterward. Be sure to use a dryer for the clothes. Hanging them on a clothesline allows them to collect more allergens. Pollen counts are lowest before dawn, in late afternoon, and during the early evening. Use those times to take walks or exercise outside with your loved one to keep allergies at a minimum. Be sure to monitor daily pollen counts and smog alerts online or on the news as an added measure. If your senior loved one can’t seem to escape the pollen at home, it may be best to get away for a while. Provided that your loved one is well enough, consider taking a vacation to a beach during the worst allergy periods. Pollen and other allergen counts are lower near the ocean as the breeze blows the pollen away. Allergies can dampen the excitement springtime usually generates for seniors. If your loved one has trouble managing seasonal allergy symptoms, turn to Home Care Assistance of Oshkosh. Our reliable Oshkosh elder care promotes senior health and wellbeing and allows seniors to age in place while maintaining their independence. Learn more today by calling (920) 710-2273 and scheduling a no-obligation consultation with a friendly Care Manager.